Growing up in Houston, Texas, I looked forward each year to visiting my maternal grandparents in Shreveport, Louisiana. One of my most cherished memories was watching my grandmother make her Dobash cake, with its eight thin layers of white cake topped with chocolate cream, and a chocolate icing covering it all. Making a Dobash cake was a two-day process. The first day, she would bake the eight cake layers, letting them cool and become firm, and the second day, she would make the chocolate filling and icing and put the cake together. My brother and I licked the spoon. 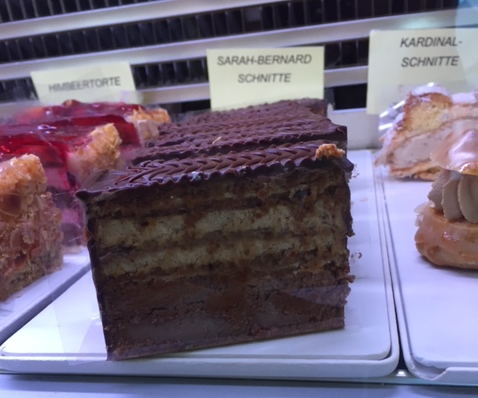 In Vienna, we searched in vain for my grandmother’s cake. Unfortunately, my grandmother’s recipe — and her cooking ability in general — ended with her generation. (She claimed that her sister made an even better Dobash cake than she did, but I didn’t think any cake could be better than hers.) After she died in 1988, I thought I would never eat another piece of this delicious dessert. But I was wrong. 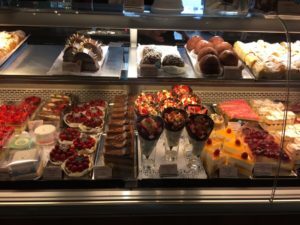 In 2010, Richard and I decided to spend our February break in Prague and Budapest, saving money and avoiding crowds by going in the off season, and at a cafe on Andrassy Street, we found…Memaw’s Dobash cake. With eight layers of white cake, chocolate pudding between the layers, and chocolate icing. 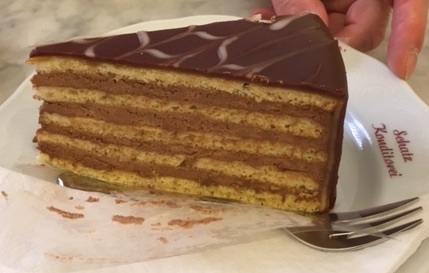 It was called the Dobos (pronounced ‘dobash’) Torte. My grandmother’s family came from Salzburg, Austria, at that time, part of the Austro-Hungarian Empire. And when Richard and I were planning our side trip from Lisbon this year, we decided to explore part of my family heritage by traveling to Austria, first to Vienna and then to Salzburg. Richard was looking forward to the art museums and the home of Sigmund Freud in Vienna. I was looking forward to my grandmother’s cake. 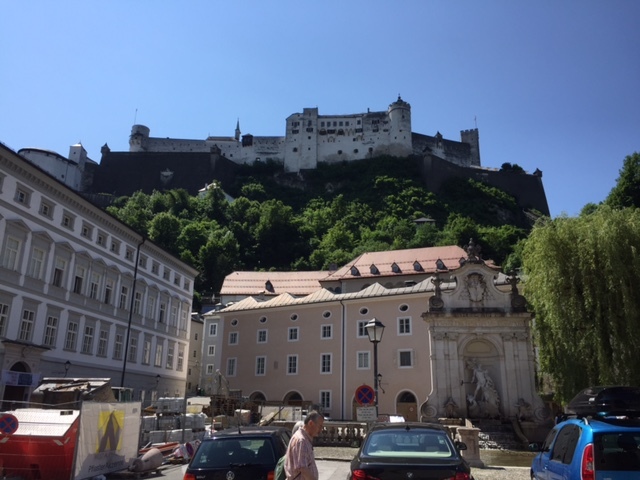 From the main square in Salzburg, looking at the castle. First stop: Vienna. We found lots of cakes, but not the Dobos Torte. Nothing even remotely like it. The closest cake with more than three layers was the Esterházy torte, another Hungarian creation with a nut-flavored cake and variety of buttercream fillings. Richard is a huge fan of marzipan, though, and at his favorite bakery (review to come) he ordered the marzipan potato. And while we’d come to believe that Austria, like Hungary, is the “land of cakes,” people seemed more interested in ice cream than cake. I imagine that a central European heat wave while we were there had something to do with this. Maybe, I thought, my grandmother’s family originally hailed from Hungary and then moved to Salzburg, carrying their cakes with them. If so, many other Salzburg bakers did the same thing, because in fact, I found cakes that both looked like and tasted like my grandmother’s cake, though not necessarily the same cake. And none of them had the name “Dobos.” One of the cafés called the layer cake, with chocolate cream between white cake, the “house cake.” But the one that evoked the flavor of both my grandmother’s cake and the one in Budapest, was the “Sarah Bernhardt Schnitte,” in which the white cake layers topped a bottom layer of chocolate mousse. It was my favorite cake of the trip. But this was the one that most closely evoked the taste of her Dobash cake. In Salzburg, we also ate dinner and dessert at the Hotel Sacher, the creator of the world-famous Sacher Torte. 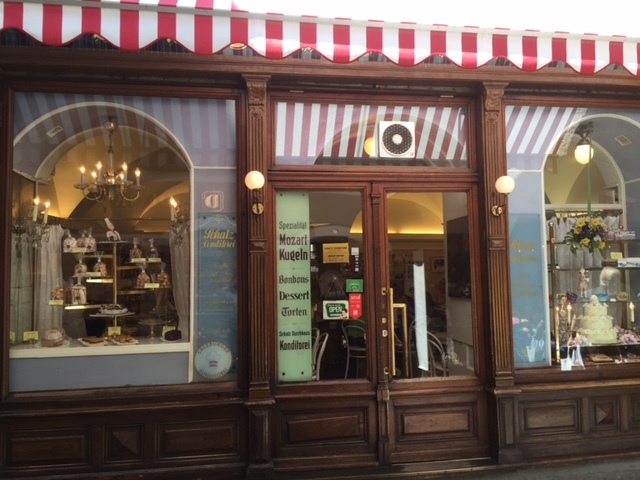 We did not stop in Linz, where I could have tried the Linzer Torte at its place of origin. I somehow managed to confuse the Sacher Torte and the Linzer Torte even though they’re not at all alike. In all, I appreciated seeing the place where my grandmother’s family came from. Salzburg is near the mountains, so it must have been a jarring experience for her parents to end up in flat, swampy Louisiana. Richard and I took the funicular to the castle where Mozart played as a child and learned about the history of the Salzburg and the surrounding region. It wasn’t an area hospitable to Jewish families, who were restricted in the work they could do and vulnerable to attack and expulsion at any time. 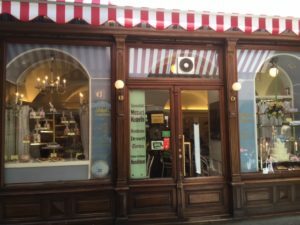 The Salzburg bakery where I found the cakes. Most of Austria’s Jews congregated in Vienna, which became a major European intellectual center by the beginning of the 20th century. And after the Anschluss, the Nazi invasion of 1938, many of the Jews, including Sigmund Freud and his family, fled the country, and most of those who didn’t flee perished in the Holocaust. Austria’s accounting for the Nazi Holocaust isn’t as obvious or extensive as Germany’s (my husband said the genius of Austria is convincing the world that Beethoven was Austrian and Hitler, German), but we saw both museum and outdoor displays that raised awareness of those dark times. 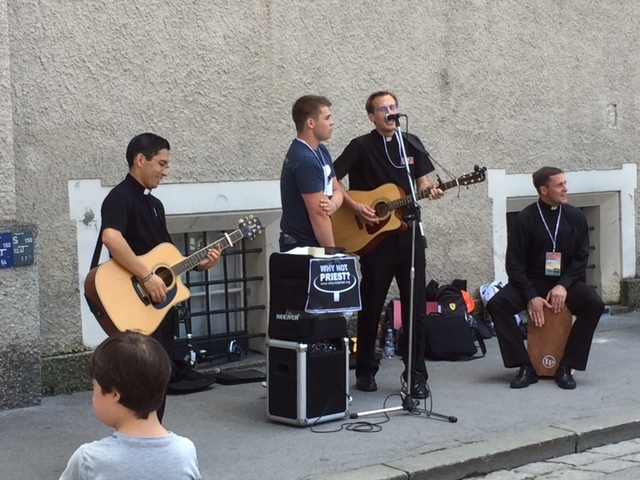 The weekend we visited Salzburg happened to be that of a festival for Catholic youth, so the main cathedral was filled with teenagers singing, worshiping, and listening to presentations on the challenges of being a Catholic in Europe today. Both the teens and their youth liaisons expressed optimism with the leadership of the Pope Francis and his message of social justice and inclusion. 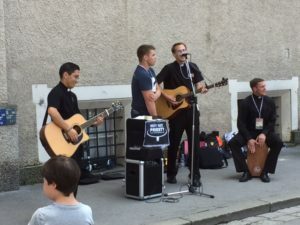 While all the attendees were German-speaking youngsters from Austria, Germany, and Switzerland, priests from around the world played rock music and soccer with the kids. A rock band of priests, with Rock Latino their specialty. While the members of my family have traveled to Germany many times and have become quite familiar with Richard’s background and heritage, this is the first time he and I have been to anyplace in Europe associated with my family. I came away from that trip with a much greater appreciation of my mother’s and grandmother’s roots, not only for the cakes but for the people and history as well. 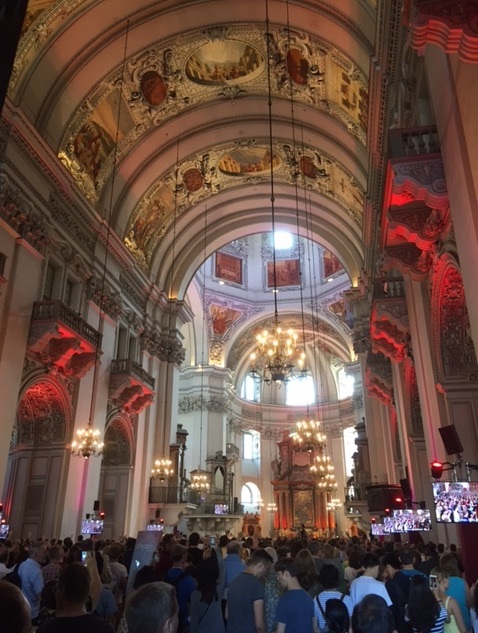 The cathedral in Salzburg hosted Catholic teens from Austria, Germany, and Switzerland. They both look like an American “seven layer cake”. Do they taste that different? I had one shipped over after we returned home from Vienna. It was a bit dry but the flavor was marvelous. I think we ate cake in Salzburg also . That’s a great trip. Miss you in Houston …. come visit !! !